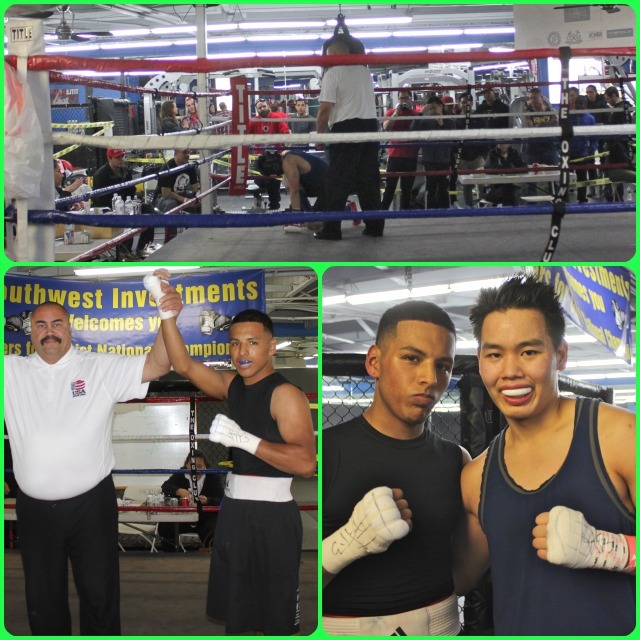 On Friday, two competitors from the opening bouts of the 2013 Boxers for Christ National Championship Tournament pose for photos at ringside after battling it out in Bout #8. 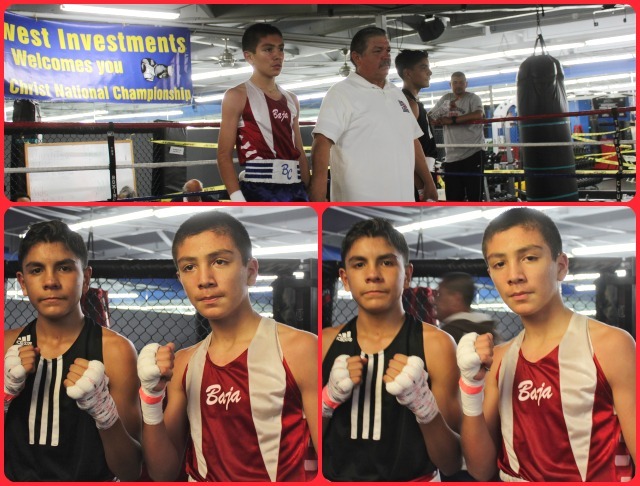 (l to r) Corie Morfin of the Eddie Heredia Boxing Club and Jose Ortega of Aztec Pride Boxing. Friday evening was the first day of competition for this annual event, a three day boxing tournament where the future stars of boxing begin their quest to become the 2013 Boxers for Christ National Champion in their perspective weight class. For this year’s event, organizers returned to the same site as last year, the San Diego Combat Academy in Kearny Mesa, a predominately commercial and industrial community in East San Diego. 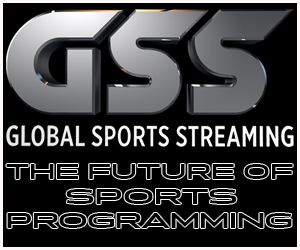 As in the past, our combatants came from near and far to compete. In Bout #1, it was Jonathan Flores (r) of the Alliance Training Center in Chula Vista, CA defeating Diego Luna (l) of Bound Boxing, Chula Vista, CA. 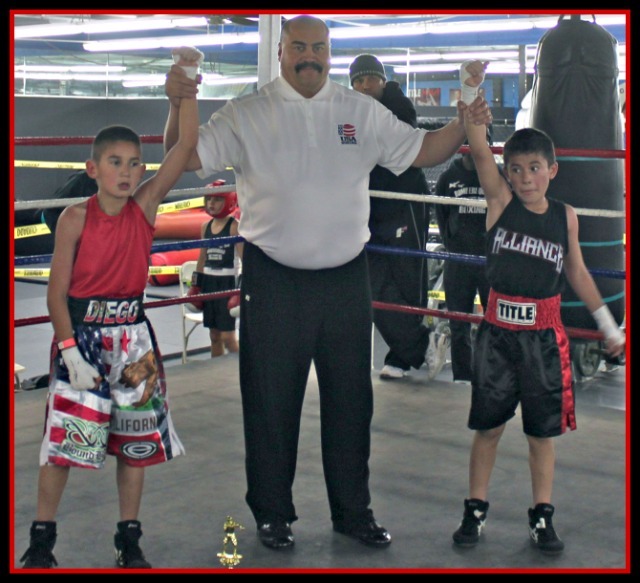 In Bout #1, (in the 9 and 10 year-old, 70 pound weight division, semi-final) it was Jonathan Flores of the Alliance Training Center, Chula Vista, CA coming away with the victory over Diego Luna of Bound Boxing, Chula Vista, CA. Simply put, Flores was the busier of the two and finished stronger in this all-action bout. 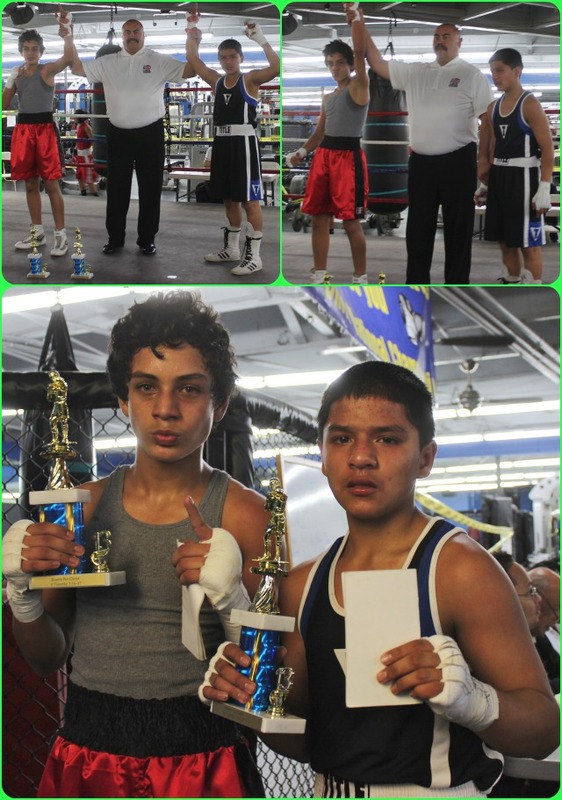 On Friday, in Bout #2, it was Julius Ballo (l) defeating Daniel Morales (r). 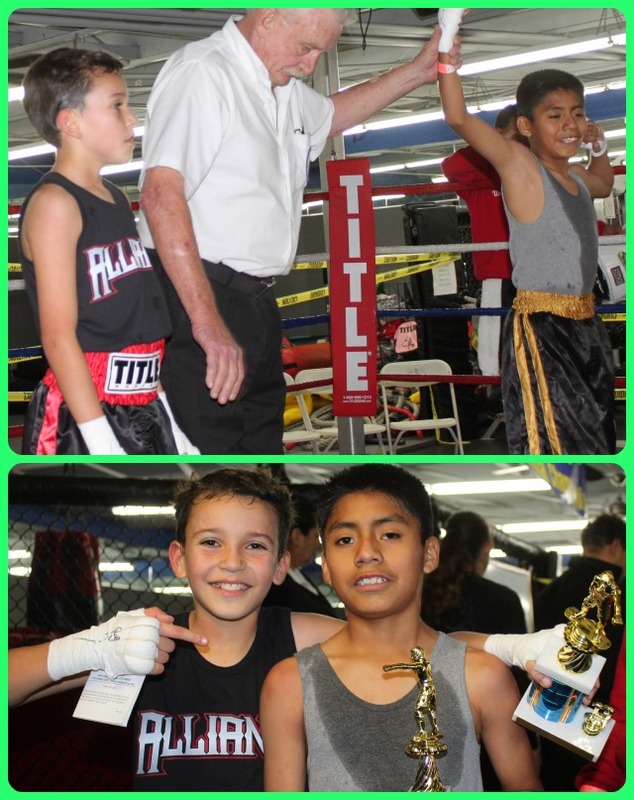 Bout #2, in the 9 and 10 year-old, 75 pound weight class final, it was Julius Ballo of the Undisputed Gym in El Cajon, CA getting the win over Daniel Morales of the House of Boxing, Paradise Hills, CA. In the early minutes of this classic righty versus lefty duel, the boxers went at it full bore with Ballo throwing straight down the pike, and Morales’ success coming from the straight lefts and left hooks. Through attrition, Ballo wore his opponent down by landing the more accurate and harder punches while exhibiting the superior hand speed. At the conclusion of their bout, a gent in the front row shouted to Ballo, “You’re a beast!” The always respectful, unassuming Ballo couldn’t help but grin. 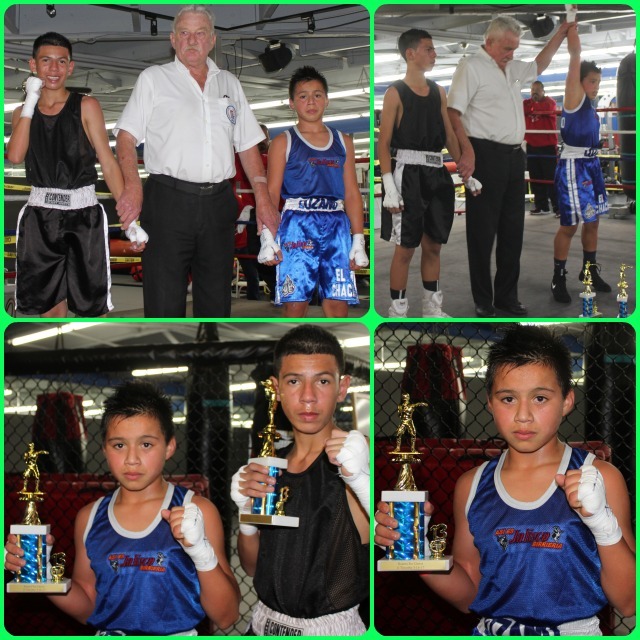 Bout #3, (in the 11 and 12 year-old, 65 pound weight class final) it was Bernardo Vasquez of Aztec Pride, El Centro, CA coming away with the victory over Antonio Zavala of the Duarte Youth Boxing Club, Duarte, CA. In summary, after two hard fought rounds that could have been awarded to either boxer, Vasquez finished this all-action bout stronger. Zavala had a good excuse for tiring, Vasquez not only had him running ragged, he was continually pinning him against the ropes to unleash his flurries. 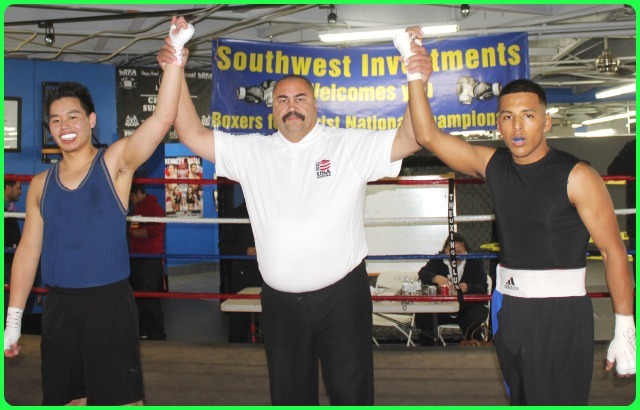 After an announcement of his victory in Bout #4 over Daniel Luna (r) from the San Bernardino More Than Conquerors boxing team, Fernando Diaz (l) of Steele Boxing, Las Vegas, Nevada had his arm raised in victory by veteran referee Rick Ley (c). 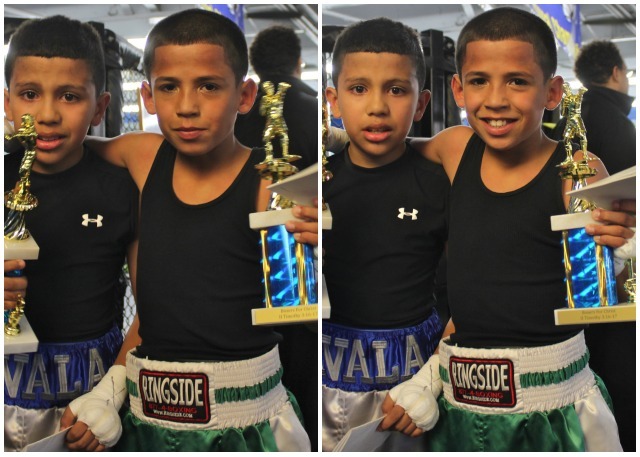 At the conclusion of their bout, Fernando Diaz (r) and Daniel Luna (l) pose for photos. 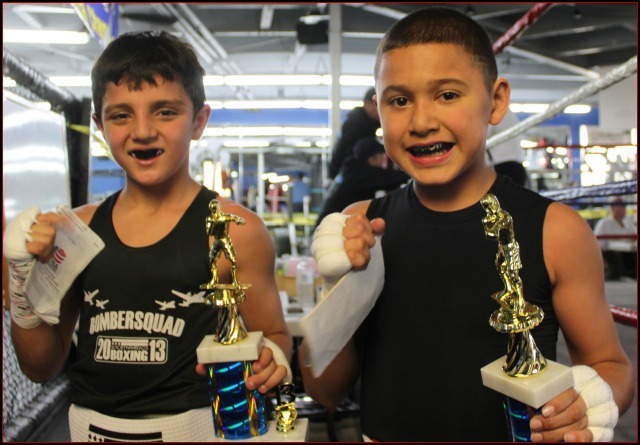 In Bout #4, they had southpaw Fernandez Diaz from Steel Boxing, Las Vegas, Nevada (in the 11 and 12 year-old, 70 pound Open division final) taking on Daniel Luna of M.T.C. 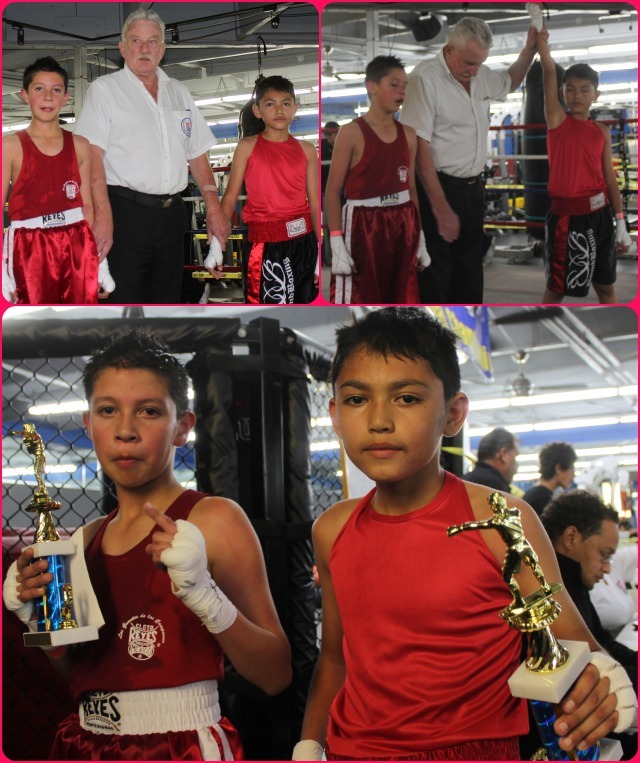 (More Than Conquers Boxing Club) in San Bernardino, CA. Diaz, who was certainly busier and obviously the aggressor throughout, was also susceptible to getting hit by the more accurate punches coming from Luna, a sharpshooter who would patiently wait and counter off each of Diaz’s misses. With the pace slowing considerably in the second and third rounds, the judging of this bout became a chore and very close to a toss-up. In the end, the judges had Luna ahead. 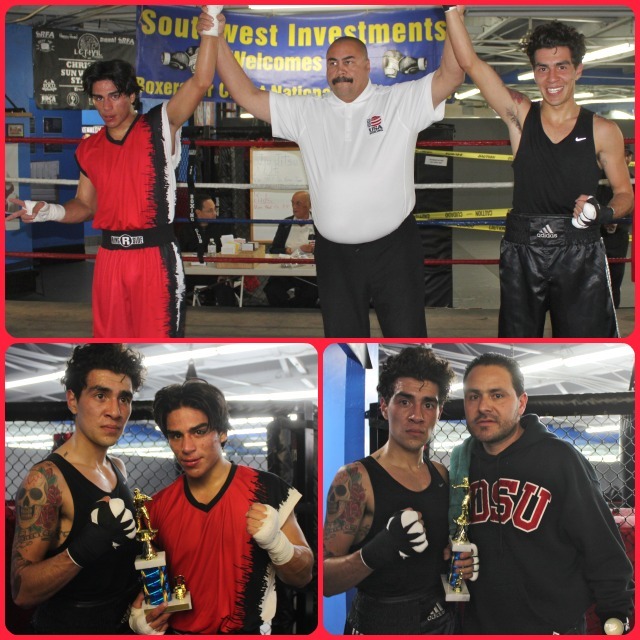 (top) In Bout #5, it was Jonathan Leal (r) earning an unanimous decision victory over Adrian Estrada (l). At the conclusion of their bout, referee Rick Ley raised Leal’s arm in victory. 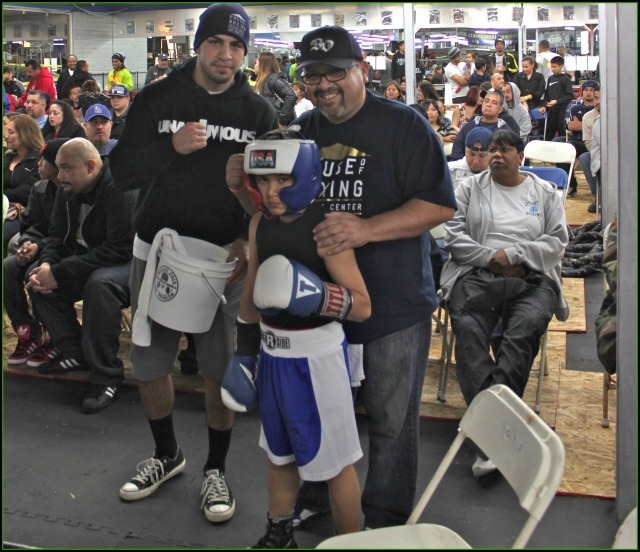 In Bout #5, it was Jonathan Leal of the United Boxing & Fitness Gym, Chula Vista, CA (in the 11-12 year-old, 70 pound Open division Finals) taking on Adrian Estrada from the Alliance Training Center, Chula Vista, CA. Since Leal forced Estrada to fight this one while backing up, he had more power behind his punches while his opponent was reduced to the less effective arm punches. In Bout #6, it was Julian Rosas from Bound Boxing, Chula Vista, CA (in the 11-12 year-old, 80 pound division Finals) taking on Abraham LaPaz of United Boxing, Chula Vista, CA. In this one, Rosas did a better job of utilizing his jab to land the majority of the one, two power shots to the head which in due course led to an 8-count being issued to La Paz which cemented the victory. Bout #7 (in the 11-12 year-old, 85 pound weight class, Finals) went uncontested to Jose Chollet of Barrio Station as his opponent Alfredo Vargas failed to either make weight or show up for the official weigh-in. (bottom photo) At the conclusion of Bout #8, it was Sebastian Estrada (l) of Riverside, CA being declared the winner over Giovani Moncada (r) of San Bernardino, CA. 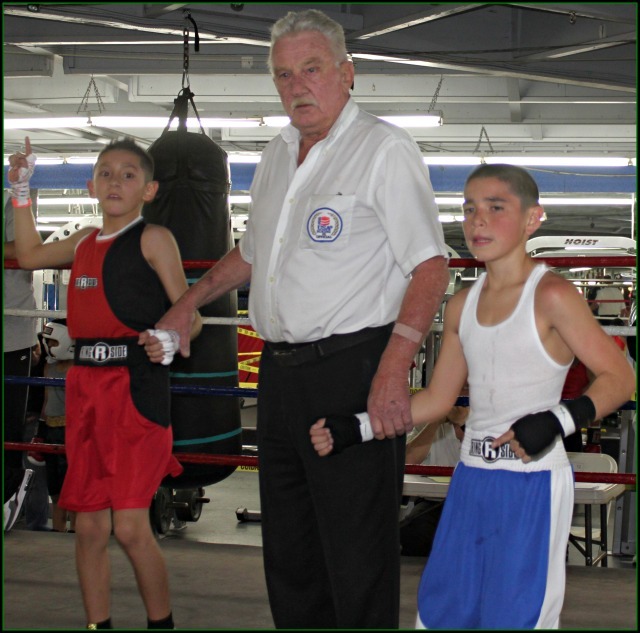 Bout #8, in the 11-12 year-old, 114 pound weight division, Novice Final, they had the taller Sebastian Estrada of the Capital Punishment Boxing Club in Riverside, CA taking on Giovani Moncada of the San Bernardino More Than Conquerors Boxing Club. While Estrada started off slow and calculating, he certainly made up for it by finishing the second and third rounds strong. The edge he held was with his dandy footwork and long reach to outscore Moncada. 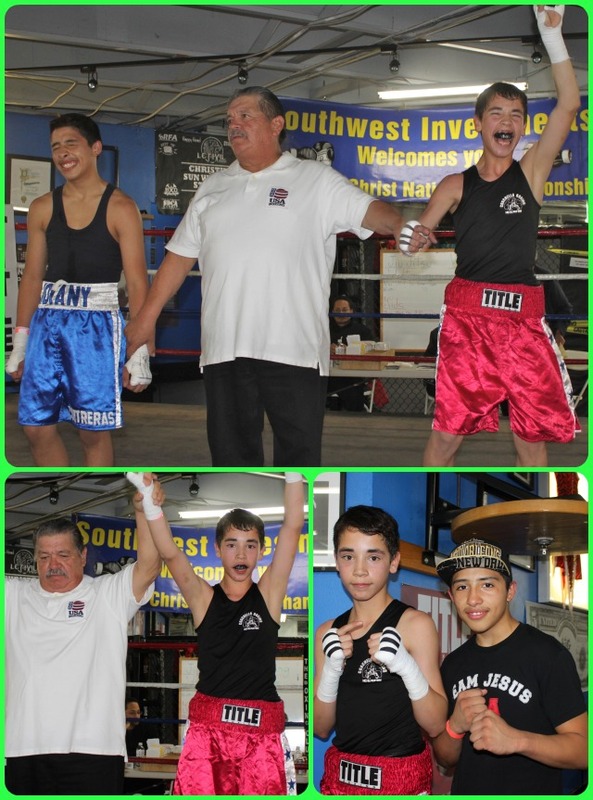 (top, left photo) Jose Ortega (r) of Aztec Boxing has his arm raised in victory by referee Rick Ley after he defeated Corie Morfin of the Eddie Heredia Boxing Club of East LA. 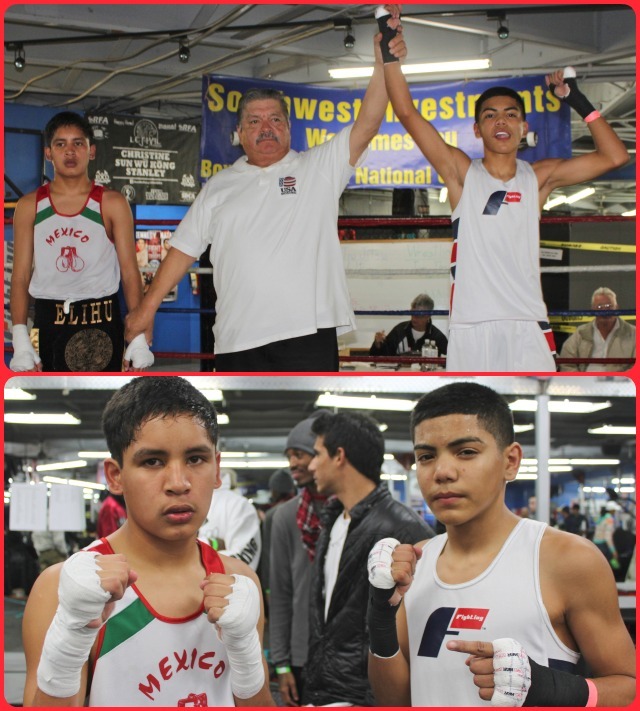 Bout #9, featured Jose Ortega of Aztec Pride, El Centro in the 13-14 year-old, 90 pound weight division, Novice Finals, taking on Corie Morfin of the Eddie Heredia Boxing Club in East Los Angeles, the gym where Oscar De La Hoya trained as a teenager. With the momentum swinging right to left in the early rounds this one showed signs of being a very competitive match. Then all of a sudden Morfin started getting tagged and running low on petrol. Halfway through round three, it was as if Ortega had taken off a mask to show his true identity. At that point he was borrowing moves from the great Muhammad Ali and even did his own Ali-shuffle before tagging his opponent with several stiff jabs. Morfin didn’t appreciate the tomfoolery and went after Ortega. What we learned? On the horizon, the young Mr. Ortega may soon be incorporating some nifty, new steps into his repertoire to show us even more flash – we’ll have to keep an eye out for this up and comer. 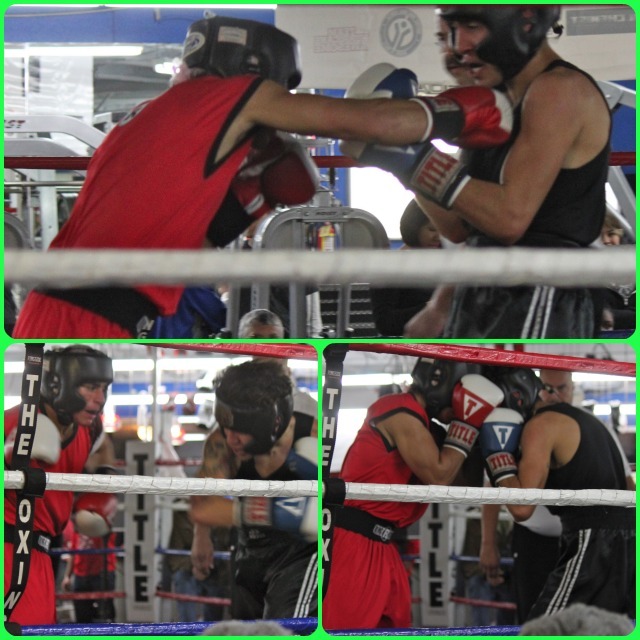 Warning to Mr. Ortega – after Morfin left the ring, both boxer and coach wasted no time discussing a strategy that would apply in their rematch. (top, right) Edwin Lozano (r) of the United Boxing & Fitness Center has his arm raised in victory by referee Rick Ley after he defeated Antonio Vasquez of Aztec Pride. 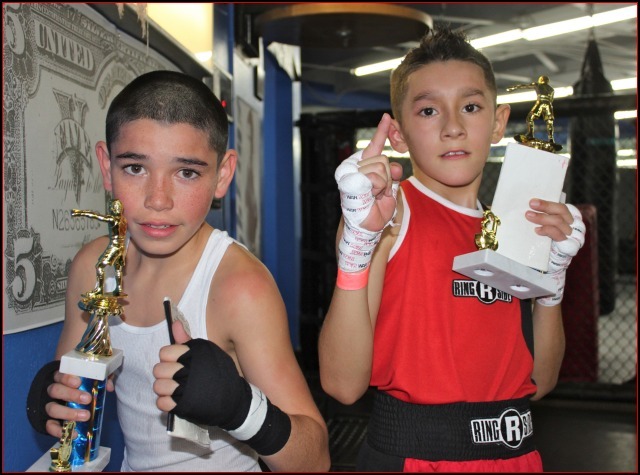 Bout #10, between Edwin Lozano of United Boxing and Antonio Vasquez of Aztec Pride in the 13-14 year-old, 95 pound division, Novice, Finals was one of the “Bout of the Night” candidates. The much shorter Lozano did exactly what he was supposed to do and got himself inside to work over the body, while Vasquez knew his best strategy was to gain better leverage, generate more power and take that initial step back before unloading his bombs. On and on they went pounding each other with Lozano first landing his jab which in turn set-up the short right and left crosses. As they say both boxers left it all in the ring. In this closest of contests, the decision went to Lozano. (photo, left) At the conclusion of Bout #11, Ray Diaz (l) poses for a photo with the boxer he defeated, Ivan Guardado of the United Boxing & Fitness Center in Chula Vista. 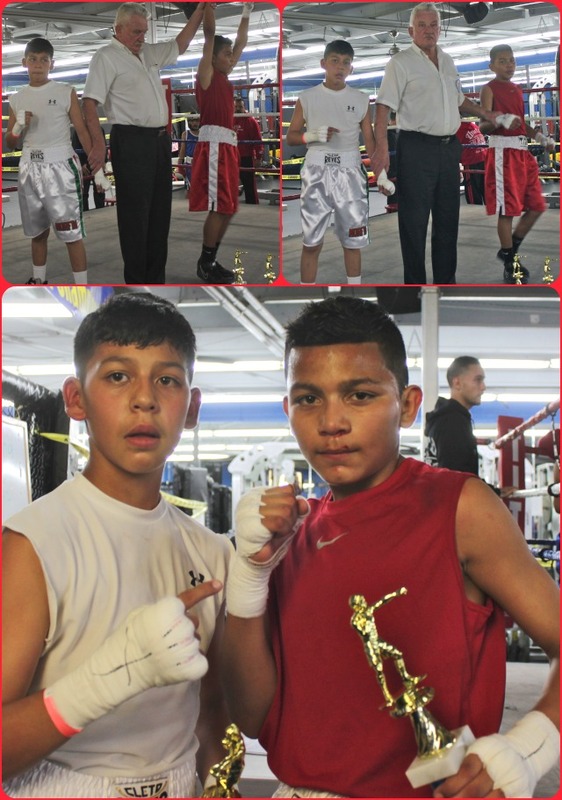 Bout #11 featured Ray Diaz of Steele Boxing going up against Ivan Guardado of United Boxing in the 13-14 year-old, 106 pound weight division, Open, Semifinals. This, like the aforementioned match, was another, nonstop slugfest and finally through attrition Mr. Diaz had worn his opponent down by landing more punches with greater power. (top photo) At the conclusion of Bout #12, Anthony Reyes (r) has his arm raised in victory by referee Jimmy Quiroz after he defeated Rudolfo Ortigoza (l). In Bout #12, it was Anthony Reyes of Coachella going up against Rudolfo Ortigoza of the Legacy Training Center in Vista, CA in the 13-14 year-old, 106 pound Open division Semifinals. The victor in this match was plan to see. 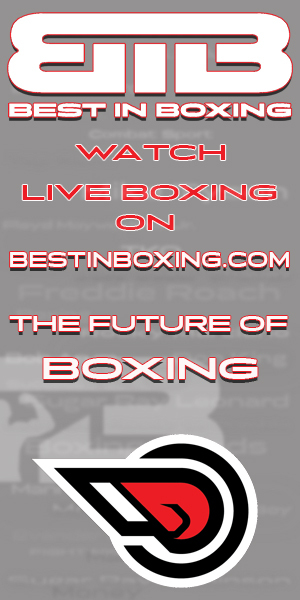 Reyes outboxed Ortigoza and made certain that he always landed more punches in each of their exchanges. (top photo) When the results of Bout #13 were read declaring Adrian Vega (r) the winner over Jovany Contreras (l), the expression on Contreras’ face hints at his disbelief. 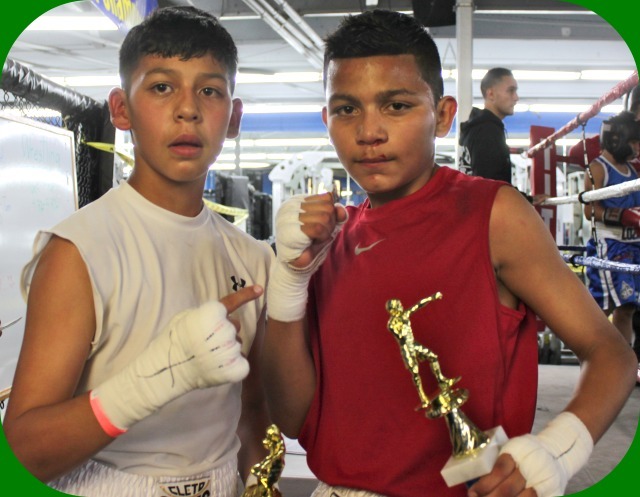 In Bout #13, in the 13 and 14 year-olds, 114 pound weight Open division Finals, it was Adrian Vega of the Coachella Boxing Club coming away with the victory over Jovany Contreras of the Barrio Station Boxing Team. In this one, we’re led to believe Vega, the much taller but less active boxer, won the judges over by way of his sharpshooting from the outside. Contreras, who had been the aggressor throughout much of the fight, put his hopes in getting kudos for working over Vega’s midsection. As it turns out, beating Vega as if he were a heavy bag, had little to no sway on the judges. (bottom right) Victor Medina (r) and the boxer he defeated Chris Harris Jr. pose for a photo after their match, Bout #14, concluded on Friday evening at the San Diego Combat Academy. 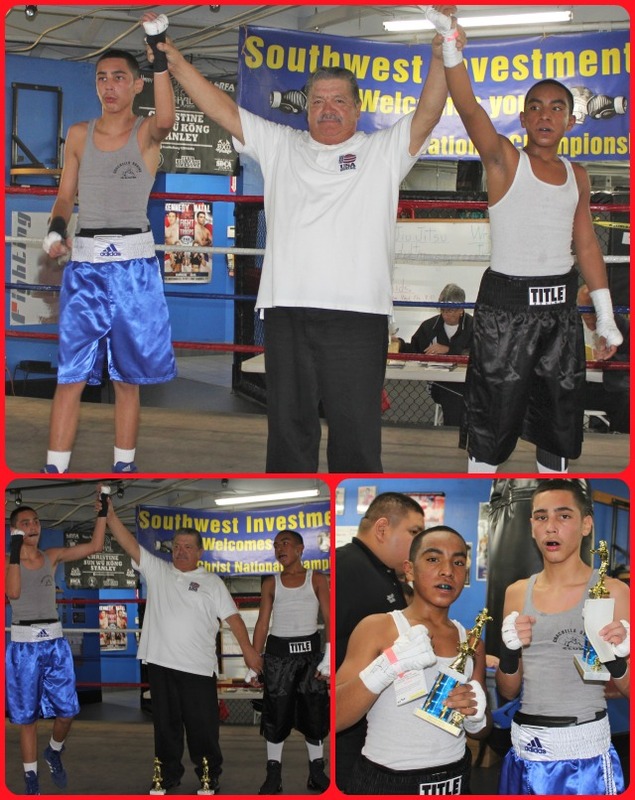 Bout #14, in the 13 and 14 year-old, 119 pound novice division Final, it was Victor “Marcus” Medina of Coachella, CA coming away with the victory over Chris Harris Jr. of Johnny Tocco’s Boxing Gym, Las Vegas, NV. Simply put, the taller Flores was like a sharpshooter and his punches kept raining down on the much shooter Harris who was unable to gain inside position against the elusive Medina who circled and showed dandy footwork. 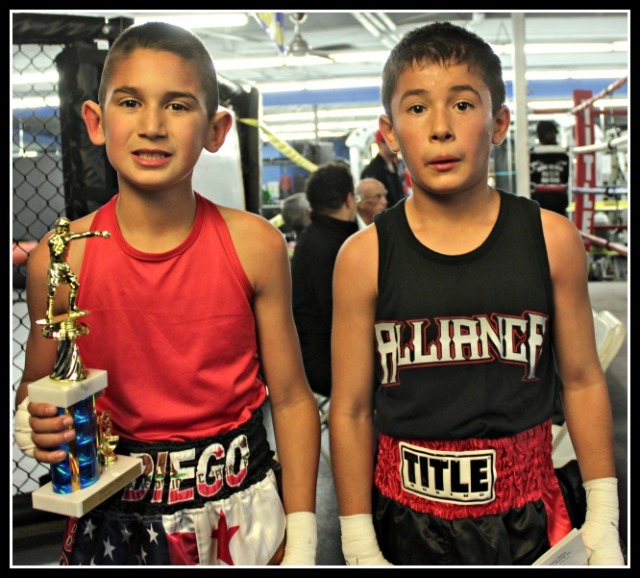 Bout #15, a 13-14 year-old, 138 pound contest between Joseph O’Donnell of the Art of Eight Training & Fitness Center and Luis Lorenzo of Intensity MMA in South San Diego ended up being cancelled. Bout #16 was a Wow! bout featuring southpaw Anthony Sanchez of the Casillas Boxing Club taking on Miguel Alcantara of Aztec Boxing in the 15-16, 125 pound Open division. With Sanchez looking so polished and getting off to such a dandy start, you had to figure the more patient Alcantara was going to lose this one. That’s just what Alcantara wanted his opponent to believe. Here he was busy calculating his reach and timing and hopefully lulling or wrapping Sanchez into this false, security blanket. After getting in close and seeing his first opening, Alcantara began to unload his carnage of hard shots to the head punctuated by one upper cut after another. Even though Sanchez did his fair share of scoring, it was Alcantara’s mastery of the uppercut in combination that insured the win. In Bout #17, it was Fabian Zarco of Barrio Station, San Diego taking on Anthony Quinones an Independent from South San Diego in the (17 year-old, 133 pounds weight division). Zarco’s in your face, don’t let the other boxer breathe style proved too much for the courageous Quinones whose head was being snapped back from the repeated straight shots to the head. Zarco gets the well deserved win. At the conclusion of their bout, Bout #18, Armando Tovar (r) and Eric Nguyen (l) have their arms raised by referee Hondo Fontan. (top photo) In Round one, referee Hondo Fontan rushes over to assist boxer Eric Nguyen who has just been knocked off his feet by Armando Tovar, the eventual winner in Bout #18. In Bout #18 we saw the only early stoppage of the tournament when the over matched Eric Nguyen, Unattached, couldn’t handle the onslaught of hard punches from the more experienced Armando Tovar of the House of Boxing (in the 17+, 141 pound Novice division). In Round one, after Nguyen went down on one knee, referee Hondo Fontan immediately stepped in to call a halt to the bout. 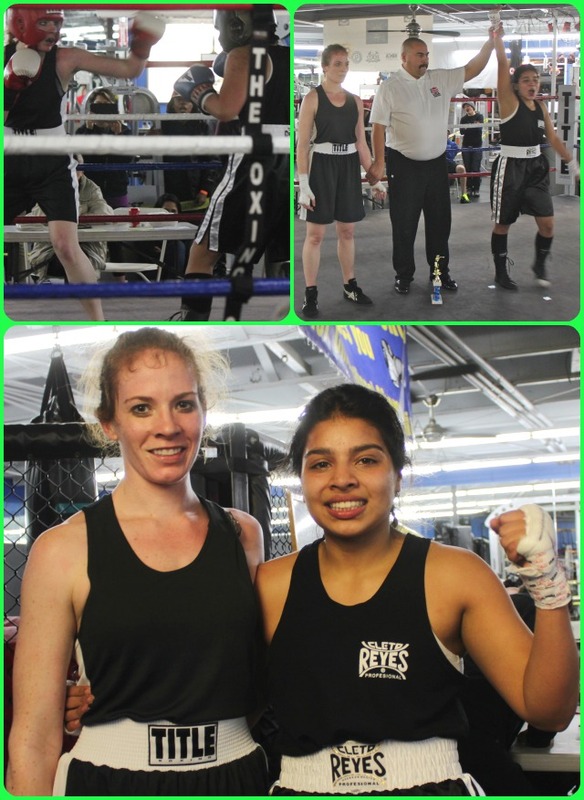 Bout #19 featured the ladies, Kimberly Deede of the San Diego Combat Academy and Jessica Corral of the National City CYAC in a semifinal match (in the 17+ female, 132 pound novice division). Throughout their match you had the much taller Deede trying her best to use her reach advantage and maintain the outside position while the shorter Corral, competing in just her second bout, kept pressing forward hoping to dominate with the harder, shorter range jab then follow with the big overhand right. In this one, the judges sided overwhelmingly with the more physical Corral even though she slowed her pace in rounds two and three. After dominating the action in Round #1, it’s possible some of the judges awarded her a 10-8 round. 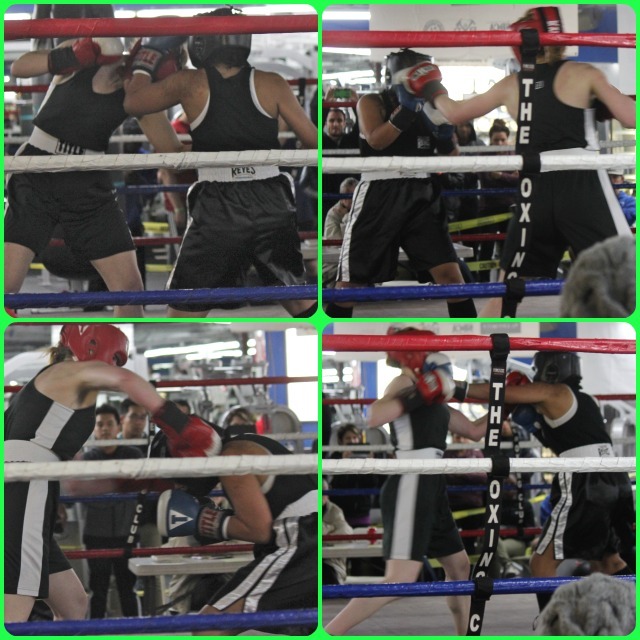 (bottom, right) In the final bout of Day 1, Bout #20, it was Rene Flores (r) from Coachella, CA getting the win over Ruben De Santiago (l) from the Jackie Robinson Park, Little Rock, CA. Bout #20 was a late addition to the lineup. It featured Rene Flores of Coachella, CA going up against Ruben De Santiago of the Jackie Robinson Park, Little Rock, CA (in the 17+, 132 pound Novice division). From the outset of this furious clash, both boxers were dealing out the punishment you’d normally see in a bare knuckle street fight. In the end it was Flores getting the nod based on his more effective inside work. 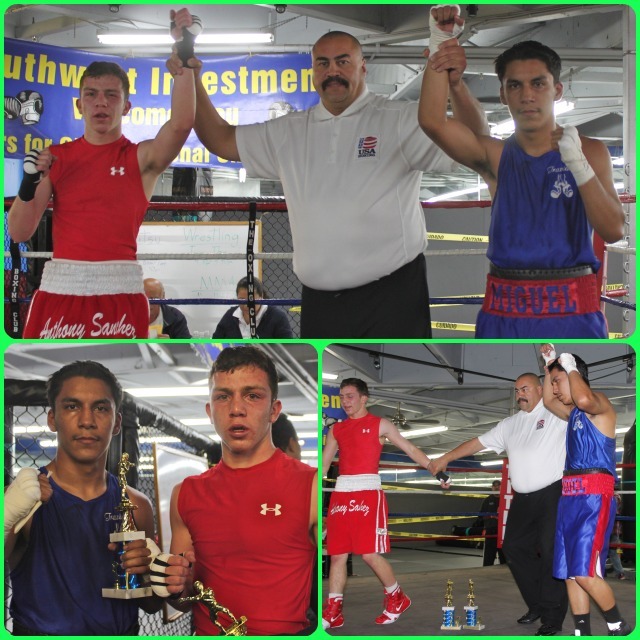 Results from Day 2 and 3 of the Boxers for Christ National Championship will follow.